Video: Jonathan Neal… on What needs to be done? The Institute is honoured to have Victoria Lambropoulos, an academic at Deakin University, Australia present for this seminar. Victoria will bring expertise in the debates which have happened in Australia around what constructive role trade unions can take in collectively bargaining for a green economy. Victoria will be joined by Sian Jones from the CWU, and Sarah Pearce from the TUC’s Green workplaces project. Climate change is an issue which affects all workers and one which trade unions have been strong in engaging their membership – this includes the increase in environmental audits and green workplace reps. So what role can unions play in creating and maintaining sustainable jobs? What way can unions engage in greening the economy? Speakers: Sian Jones, CWU; Victoria Lambropoulos, Deakin University, Australia; Sarah Pearce, TUC. THE GOVERNMENT’S LOW CARBON TRANSITION PLAN AND THE TRADE UNIONS’ MILLION JOBS PLAN – WHAT’S THE DIFFERENCE? Prof. Barbara Harris-White looks at the flaws in the government’s strategy. The briefing paper below is based on her talk. 1. In July 2009, after more than a decade of policy instability, wavering and issuing many other plans and goals for Britain’s climate change response, the government published a Low Carbon Transition Plan (LCTP). If you know about this and want simply to know the answer to the question in the title, please fast track to section 7. For everyone else, this briefing tells you about the government’s plan, what the problems of the plan are, what the Tory alternative is, and then what the unions are doing. We will cut Greenhouse Gas (GHG) emissions by 34% on their 1990 levels – and by 18% on their 2008 levels by 2020. This will happen in five parts of the British economy – energy, transport, homes, workplaces, and agriculture/waste. By 2020 there will be 1.2 million green jobs. Energy/ ‘Power’. Half of the total emissions cuts between 2010 and 2020 will come from shifting to green power. Three quarters of the drop will come from shifting to low carbon energy – renewables – and one quarter from shifting from oil and coal to nuclear power and ‘clean coal’. We will import half the gas we currently import and a ‘smart grid’ will link the many new energy sources with the national distribution network. Transport. One fifth of the total drop between now and 2020 will be in transport (a 14% drop on 2008 levels). This will be achieved by cutting the emissions of the average new car by 40% (more on other vehicles below). Electrical charging points will be created in 6 urban areas. All air transport within Europe will have to join the EU’s Emissions Trading Scheme (more on this below). Homes. 15% of the total drop will be in homes, achieved by means of improved energy efficiency (insulation, more efficient boilers, etc) together with the use of renewable energy technology (solar heating, etc) in 1.5 million houses. ‘Pay as you save’ schemes will help those who install renewable energy at home to pay for the costs as they save CO2 emissions.. Fifteen towns will champion innovations. 7 million homes will get whole-house make-overs to conserve energy. All this will reduce 2008 levels of CO2 emissions from homes by 29%. Workplaces. A tenth of the planned drop will be at work (a fall of 13% on 2008 levels). More workplaces will be included in the EU’s Emissions Trading Scheme (discussed below) and there will be subsidies and support for UK based renewable energy manufacturing. 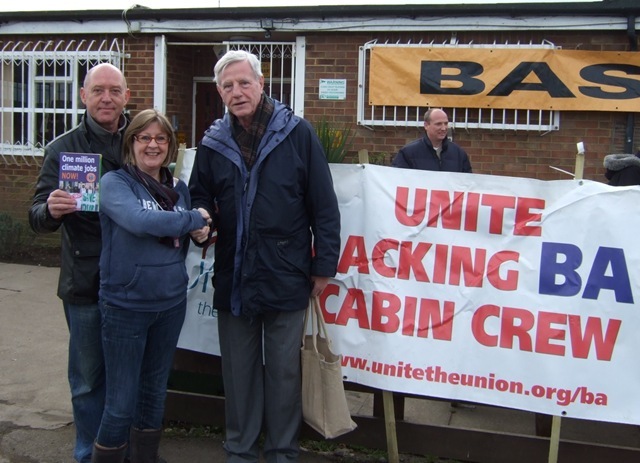 At the Campaign Against Climate Change Trade Union group meeting last weekend, supporters of the group voted to support the British Airways strikers who were taking part in their second strike. A message of support was sent to the picket lines at Heathrow, together with a cheque towards the hardship fund. Despite some in the environmental movement who believe that workers in carbon intensive industries are part of the problem, we believe that there needs to be a Just Transition towards a zero-carbon economy. To do this successfully will require a strong Trade Union movement, and a victory for the BA workers would be a victory for the whole movement. Jonathan Neale of the Campaign Against Climate Change explains why Copenhagen failed and the sort of movement we need to build. Chris Baugh of the PCS sets out a strategy for trade unionists to tackle climate change. Graham Petersen of the UCU looks at the relationship between the education system and responses to climate change. Amancay Colque describes the way in which the Bolivian delegation behaved at the Copenhagen talks and emphasises the importance of the upcoming conference in Cochabamba.